"In the early 80's, Ebizimor and other gifted stars of Ijaw origin like Professor I.K. Belemu, Master Pereama Freetown and the White Eagle brought back highlife nicknamed Owigiri in a different sytle and from dominating the instrumentation with the vibrant guitars and exciting Rhythms which were missing in the early 60's and 70's. As a born philosopher, his songs conjured images. They were like themes which give root to varying development and movement. 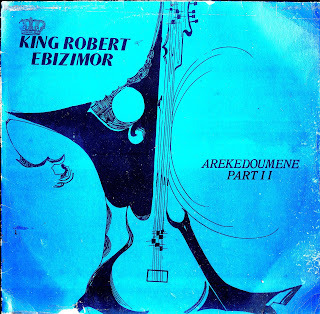 The Agaibrir musical king created issues out of themes and provoked the thought of his audience to the point of inspiring and even mobilizing them to action, but the greatest weapon is his voice which he projected with happiness and enthusiasm"
Bestman Doupere Junior had told me roughly the same thing and added that Ebimizor's music was more philosophical and Belemu's music had more of a dancehall approach. Ebizimor's band were also training ground for other great performers like Bestman Doupere, Anthony Cockson and Barrister Young. I also found that Ebizimor started out in the Professional Seagulls band. Personally, I have always been drawn more to I.K. Belemu's music with its infectious rhythms and uptempo vocals, but this track by Ebizimor caught my ear. I think the rough translation of the title is something like Izon conceals the good and fertile lands of Endoro. The vocals dominate the song and have a coolness to them that mixes the authenticity of his sound and message with a down tempo guitar and drum beat. I like the way his voice carries the tune and the call and response he has with the chorus. Whatever they are singing about you can feel the wisdom and truth of what they are saying. I have been listening to it a lot lately. Very meditative.